I'm having a second child. What's the best way to tell my first? Chrissie Russell has a baby on the way and a curious three-year-old. So she asked for some expert advice. HAVING A SECOND child brings with it its own set of anxieties, but one of the biggest dilemmas has to be the old classic: How do you break it to your first born that there’s about to be a new kid in town? 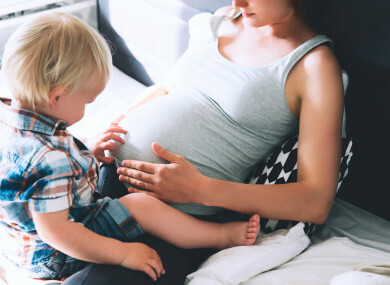 With a baby due next year and a three-year-old to prepare, Chrissie Russell asks: What’s the best way to tell a toddler you’re pregnant? But saying that, you mightn’t want to leave it too late – when the bump is getting bigger – and risk someone else bringing it up. Nor do you want to strike too early. Try picking out playthings for ‘our baby’ and reading stories about impending arrivals – like My New Baby by Rachel Fuller and There’s A House Inside My Mummy by Giles Andreae and Vanessa Cabban. Usually when you tell someone you’re pregnant there are a set of standard responses. ‘Congratulations!’ ‘When are you due?’ ‘Is it a boy or a girl?’ Children react differently. When I told my three-year-old ‘Mummy has a baby in her tummy’, he immediately lifted my top and declared ‘no there isn’t’. Later he expressed a desire to ‘take it out’. As much as you might want to, don’t rush to tell you’re tot they shouldn’t feel upset or angry. “Allow them to have whatever reaction they have and let them talk it out,” advises Allison. Instead, try saying ‘OK, why is that?’ and aim to connect at the kid’s level – seeing it through their eyes. If at all possible, it’s best to hold off on other areas of major transition like weaning, potty training or moving a child into their own bed. “As much as you might want to have everything ready in time for the baby, the child might not be ready and already have enough to process,” says Allison. At the root of any negative feelings your child has about a new baby, are concerns that they’re not going to have as much of your attention. And though the reality is that you will be busier and won’t have as much time to go around, you still have enough love. This can be shown in what the psychologist Oliver James dubbed ‘love bombing’ or ‘resetting your child’s emotional thermostat’. Essentially all it is is setting aside an amount to time to spend solely with the child where the child gets to decide what you do and feels important. When the baby’s born, a little gift specifically from the baby (something really small that in a toddler’s head could conceivably have been bought by the baby) is a nice symbolic way to reassure the child that this arrival is a positive thing. “Everyone survives it,” laughs Allison. “I think sometimes we worry ourselves too much about these things. It’s a transition, the dynamics of the family will change but you will get over it. And the sibling relationship is a powerful one, siblings teach you a lot. It’s the longest relationship you’ll have in your life and one of the most influential. Want to win a night of luxury in the sumptuous surrounds of Clontarf Castle Hotel? Enter here. Don’t forget to like TheJournal.ie’s Family Magazine on Facebook and Twitter too! Email “I'm having a second child. What's the best way to tell my first?”. Feedback on “I'm having a second child. What's the best way to tell my first?”.